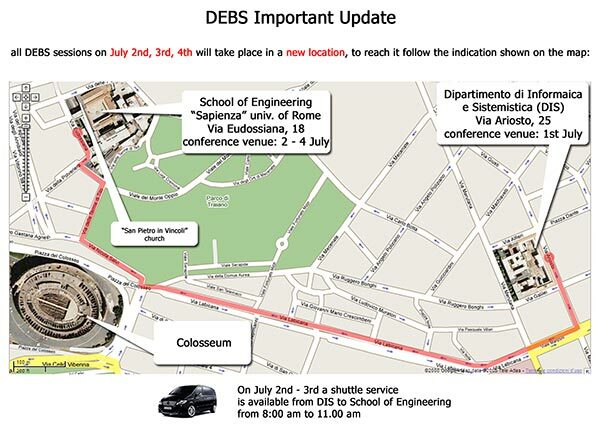 due to a breakage of the air conditioning system in the building of Via Ariosto, 25, the DEBS conference will take place in the "Aula del Chiostro" at the School of Engineerinng of the University of� Rome La Sapienza (Via Eudossiana, 18) ONLY FOR THE DAYS July 2nd, July 3rd and July 4th. The venue for July 1st is confirmed to be Via Ariosto 25 (Tutorials, Workshop Esteem and the Welcome Reception). On July 2nd and July 3rd from 8.00 am to 11.00 am a shuttle bus will be available to carry attendees from Via Ariosto 25 to Via Eudossiana 18. Note that Via Eudossiana, 18 is at 15 minutes walking distance from Via Ariosto, 25. We apologize for this unexpected event, completely out of our control, but this change of venue will allow you to enjoy DEBS conference in a wonderful cloister of the 15th Century one minutes walking from the Colisseum and next to San Pietro in Vincoli Church. The 2nd International Conference on Distributed Event-Based Systems (DEBS) is following on the success of first edition held in 2007 and the previous five editions of the DEBS workshops held from 2002 to 2006 in companion with major conferences such as ICDCS, ICSE, and SIGMOD/PODS. The conference is organized in cooperation with USENIX, the IEEE and the IEEE Computer Society, ACM (SIGMOD and SIGSOFT), and IFIP. USENIX is offering a number of grants to cover student registration fees. More informations can be found here. The objectives of the DEBS Conference are to provide a forum dedicated to the dissemination of original research, the discussion of practical insights, and the reporting on relevant experience relating to event-based computing that was previously scattered across several scientific and professional communities. The scope of the conference covers all topics relevant to event-based computing ranging from those discussed in related disciplines (e.g. coordination, dependability, software engineering, peer-to-peer systems, Grid computing and streaming databases), to domain-specific topics of event-based computing (e.g. workflow management systems, mobile computing, pervasive and ubiquitous computing, sensors networks, user interfaces, component integration, Web services and embedded systems), to enterprise related topics (e.g. complex event detection, enterprise application integration, real time enterprises and Web services notifications). The conference also aims at providing a forum for academia and industry to exchange ideas, for example, through industry papers and demo papers. The venue will be the Dipartimento di Informatica e Sistemistica "Antonio Ruberti", Sapienza Università di Roma, Via Ariosto 25 (map), Roma, Italy. DEBS 2008 is sponsored by Sapienza Università di Roma, Eventzero and Sapienza Innovazione. July 3rd, 2008: Photos from the conference are available online. June 27, 2008: IMPORTANT COMMUNICATION - The conference venue has changed for July 2nd, 3rd and 4th due to technical reasons. Please check the debs site home page for further details. June 24, 2008: The final version of the conference program is now available. May 28, 2008: A preliminary version of the conference program is now available. May 18, 2008: DEBS 2008 is now sponsored by Eventzero. Subscribe the DEBS 2008 RSS feed to stay in touch with the latest conference news.